As Valentine’s Day approaches, Nouri’s will be showcasing their array of sweets and desserts for this holiday focused on love. Valentine’s Day is not only a holiday to celebrate your spouse or significant other, but also friendship and family. Here at Nouri’s, we are focused on offering the best sweets and desserts so that you, our valued customers, can fully enjoy the moments with your loved ones. One particular dessert that is very popular is baklava. With many recipes spanning various different countries, it can be agreed that this dessert is a memorable one that will enhance any time spent with others. The delicious layers of fillo dough baked to a perfect crunch as well as the nuts nestled in the middle of the fillo dough, and then covered with a delicious sweet syrup, this dessert may seem like a tough one to master but in actuality, is fairly simple. 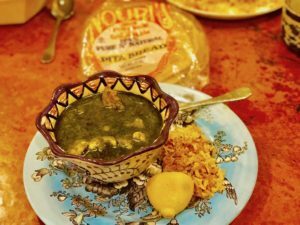 Nouri’s offers both options for our customers. We carry all the ingredients needed to make this decadent dessert as well as offer the dessert ready to go. In fact, we bake our family’s baklava recipe in our cafe right next door to the supermarket. 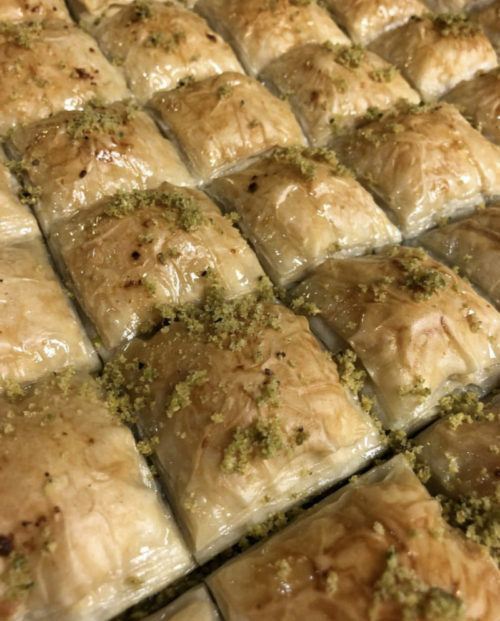 Whether you buy the ingredients to make at home or decide to buy baklava ready to eat, you will surely not regret it! 3. Use the 1st package of fillo dough on the bottom. 6. Use the 2nd package of fillo dough over the nuts mixture. Final Step: Take out the baklava and add the syrup all over, keep some on the side for anyone who may prefer it a bit sweeter. Wishing all a very Happy Valentine’s Day! 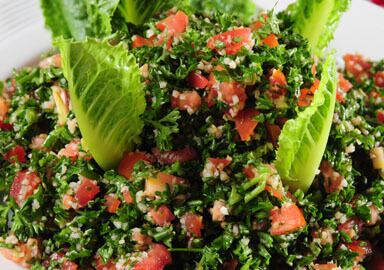 A lot of people only think of tabbouleh once you talk about Lebanese salads. It’s a fact that this parsley-bulgur blend is common but, fattoush is a favorite of many. It may be unpopular in the U.S but a it a delight in Lebanon, enjoyed by a great number. The definitive taste of fattoush is from the sumac and pomegranate molasses — sweet-sour syrup found in Nouri Brother Middle Eastern markets. The veggies have to be glistening from the molasses and meticulously spotted with specks of the sumac. Sumac is becoming more available in American grocery stores. It’s an amazing tart spice which comes from a little red berry that grows wild all through Lebanon. You can buy it in the Middle East segment of a number of retail store and some spice sections of specialized stores; however it doesn’t compare to buying it in Lebanon. Most additional ingredients are equally sliced or diced to look like an American chopped salad. 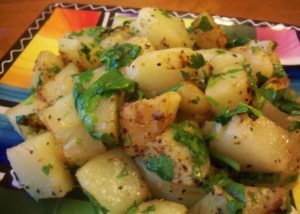 The main components are purslane (baqleh in Arabic) — a somewhat lemony micro-green which you can find seasonally at farmer’s markets or specialty stores in the U.S. It gives an incredible freshness when mixed with the romaine lettuce. In case you can’t find it make use of arugula or watercress as a substitute or just stick with the romaine. The extra featured ingredients in fattoush include cucumbers. In Lebanon, there are actually some fantastic small seedless cucumbers that have a soft, tender peeling. The perfect replacements are English seedless cucumbers which have become increasingly available in U.S. grocery stores, or small cucumbers which are used to make pickles. Other fattoush ingredients are tomatoes, onions, green pepper, radish, fresh parsley and fresh mint. The sumac is sprinkled over the salad and used in the dressing, which is usually made with lemon juice, olive oil and pomegranate syrup. In a few parts of Lebanon, the fattoush dressing is made with red vinegar as opposed to lemon juice, or a mixture of lemon juice and red vinegar — alongside the olive oil and pomegranate syrup. Absolutely everything! 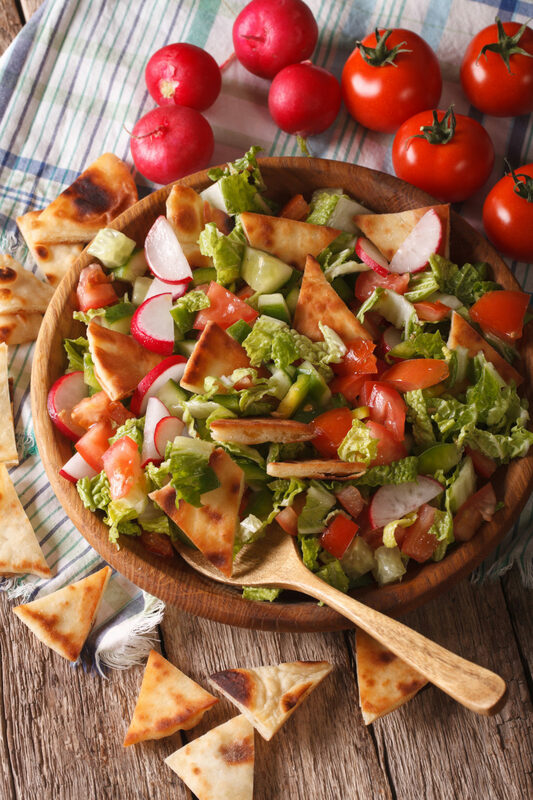 The health advantages from consuming a diet packed with vegetables and whole foods like the Fattoush salad include weight loss, reduced insulin secretion – better sport performance as well as a lower risk of diabetes, heart disease, hypertension and most cancers. Veggies and whole foods are low in calories but still fill you up, giving your system nutrient-dense macro- and micronutrients in order to function at the best possible level. Also raw garlic and grind black pepper have antibacterial and anti-inflammatory properties which help improves digestion. 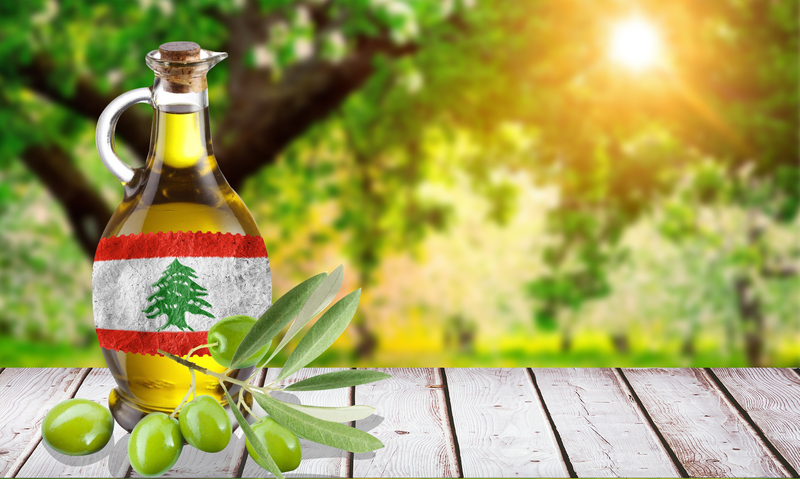 Lebanese olive oil, Lebanon is well-known for its luxurious olive orchards dating back hundreds of years. The country is a haven for a number of the most ancient olive trees on earth, most of which date back over 1,500 years. Even though the origin of the olive tree is unknown, several studies shows that the olive was first grown on the shores of the Mediterranean along the coasts of Lebanon and Palestine and the Phoenician were the first to domesticate and adapt the wild olive tree to cultivation. Since 1600 BC, Phoenicians brought in the olive tree to Greece and then to Italy, France, Spain and lastly North Africa. Olive trees take up an area of 563 km2 (56,300 ha) in Lebanon, which is 5.4% of the country’s area, or 8% of entire farming lands. Lebanon’s olive trees are largely rain-fed. Only 8% of the olives grown area is irrigated. This is primarily on account of the somewhat plentiful rainfall in the country. Around 70% of the olive cultivated is for the production of olive oil and the leftover is destined to the production of table olives. The Lebanese olive oil output of Lebanese olives amounts from 18-25%. In addition olives harvested in October and November deliver higher yields than those grown earlier or later on in the season. The milling procedure also has an effect on yields: modern mills remove between 8-12% more oil from the olive inclusive of oil that must be processed, and pomace oil. Diverse qualities of olive oil are produced, the perfect being extra virgin olive oil. Extra virgin lebanise olive oil need to be made by olives that are totally free of any kind of disease, harvested at the ideal time, and processed right away. If the olives are selected from the ground rather than the tree, the quality of the final oil is jeopardized. No chemicals need to be put into the oil, and the last oil has to pass many tests and meet numerous strict standards, to be considered extra virgin. 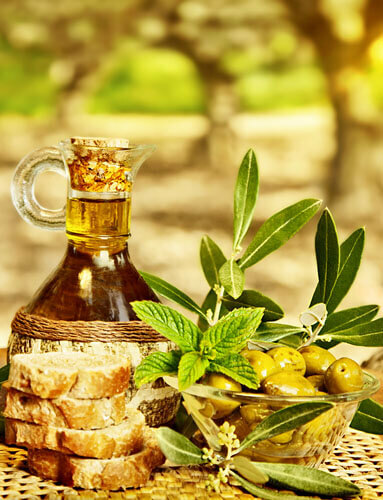 The Lebanese olive oil has a numerous health benefits; possessing an abundance of health protective nutrients. Also Olives have many variations and distinct shade of colors and are the cornerstones of the Mediterranean diet which are considered some of the healthiest diets all over the world. 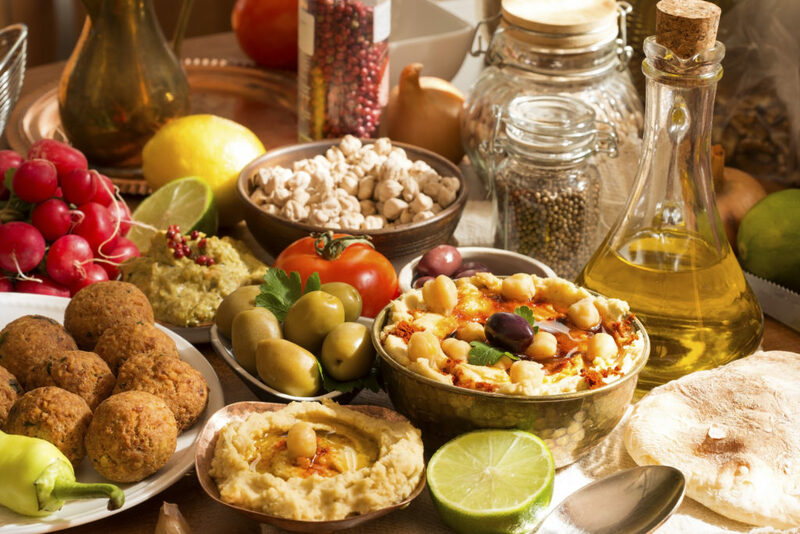 Although a diet full of saturated fat may likely add to the risk of diseases, healthy fats in our every day diet like olives and olive oil protects from numerous chronic diseases like diabetes, high blood pressure, heart diseases and cancer. Additionally, olives and their oil hold a great deal of antioxidants that is one of the components responsible dealing with inflammation with powerful health advantages. Also they are an excellent source of Vitamin E and K and carotenoids and are popular for their role in defending, nourishing and hydrating the skin and hair. 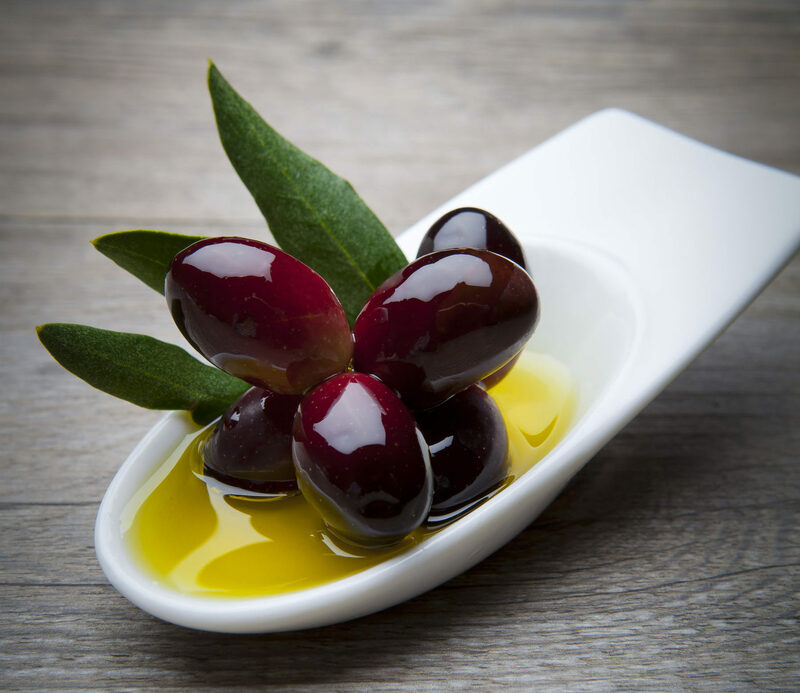 After knowing the health benefits of olives and olive oil, make sure to add them in your diets always but remember that ‘’moderation is key” because of their high caloric content. Olives could be included in salads, Tabouleh, Muhammara, and in numerous tasty recipes with pasta, fish, potato, cheese and pita bread. Also they are used to make spreads and tapenade. Don’t just worry about the fats, olive possess healthy fats compared to other fats. Nouri Shopping Center carries over 20 brands of Olive Oil. 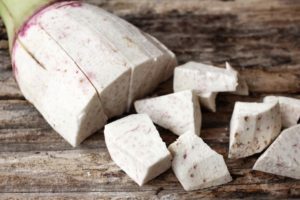 Eating Taro (Kolkas) or (قلقاس) is an Egyptian recipe, also eating Kolkas is a must on January 19 which is a Coptic holiday celebrating Epiphany (عيد الغطاس). Kolkas commonly refers to the plant Colocasia esculenta, the most widely cultivated species of several plants in the Araceae family which are used as vegetables for their corms, leaves, and petioles. 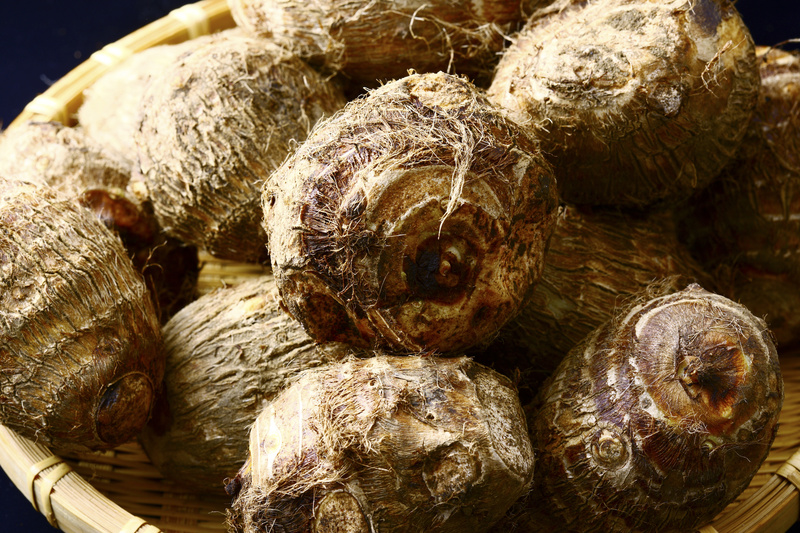 Taro or Kolkas is native to Southern India and Southeast Asia as well. Kolkas can be found fresh (in season) or frozen all the time at Nouri Brothers. Kolkas is normally cooked as a stew and usually cooked with lamb. Trim lamb of excess fat and cut into 2 inches cubes. Peel the kolkas, cut into 1 Inch cubes, and place in a bowl of water add salt to prevent browning. Heat olive oil in a large saucepan over high heat. Add onion and lamb, and cook, stirring, for 5 minutes or until lamb starts to change color. Add cups of water and bring to the boil, skimming any fat from the surface. Reduce heat to low and cook for 20 minutes. Add drained Kolkas and cook for a further 25 minutes or until lamb and taro are tender. Meanwhile, to make sauce (taliya) heat oil in a frying pan over medium heat. Add garlic and ground coriander, and cook, stirring, for 3 minutes or until garlic is golden. Set aside. Lebanese Tabouleh is without a doubt one of the healthiest salads you could possibly eat. Tabouleh is Mediterranean goodness. It’s a traditional Middle East salad with fresh herbs, primarily parsley, mint, bulgur whole wheat, tomatoes, onions as well as seasonings. This is certainly an excellent substitute for a classic salad. Unlike a regular salad, Tabouleh will certainly fill you up and you will remain content for several hours. It is also affordable compared to normal salad. The Essential Ingredients and Health Rewards of the Lebanese tabouleh are enormous; here are few reasons why you should consider including the Lebanese tabouleh in your diet plan. Parsley – There are basically two types of parsley curly or Italian flat. A lot of people consider parsley as just a garnish or sprinkles in soups or meals. Flavonids – Flavonids act like antioxidants. They help in curing and dealing with a lot of ailments like hepatitis, gingivitis and so on. As regards gingivitis, did you know consuming parsley eliminates deals with the problem of poor breathe, as well? Volatile or Essential Oils – The volatile natural oils present in parsley have been shown to prevent tumors in animals particularly with regards to the lungs. There is no any kind of human studies; but this could definitely be accurate for human beings too. You can get five grams of dietary fiber per serving and also a variety of the daily needed vitamin supplements, minerals, as well as antioxidants to sustain a healthy diet plan. Bulgur wheat carries a nutty alongside an awesome chew that fills you up. This result would absolutely keep you from snacking later on. Mint – Mint is widely noted for its potential to sooth the digestive tract as well as lowers the intensity and duration of abdominal pains. Onions – The health rewards of onions overshadow the terrible breathe; besides, with Tabouleh, the parsley usually takes proper bad breathe issue. Onions also plays a significant role in preventing colds as well as lessens blood pressure levels and boost anti-oxidants in the body system. Tomatoes – Tomatoes are a good source of Vitamin C and anti-oxidants. Lemon Juice – Lemon juice is an excellent ph balance in your system. It will certainly reduce the alkaline which is vital to your digestion. It is also rich in Vitamin C.
Olive Oil – Natural olive oil will help reduce heart problems, dangers of colon cancer as well as breast cancer. These are the primary ingredients of Tabouleh. 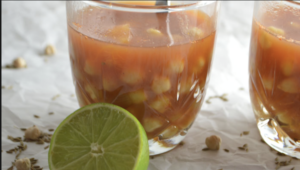 Nevertheless, you can include a lot of ingredients to it to produce a variation. Put nuts or even beans for protein, dried fruits or substitute the olive oil. You may also prepare Tabouleh making use of pita bread and putting extra tomatoes, cucumbers or perhaps whatever your very own vegetable liking is. Hummus Sham Halabisa is a very popular drink/soup in Egypt. You can even find hummas stands on the streets in many corners in Egypt and it tastes delicious! Bring the beans to a boil and leave it like that for about 30 minutes, t and let it simmer on low heat. Add the diced tomatoes, paste, minced garlic, chopped onion, salt, cumin and lemon juice. Serve in a cup with one part chickpeas and 2 parts soup. 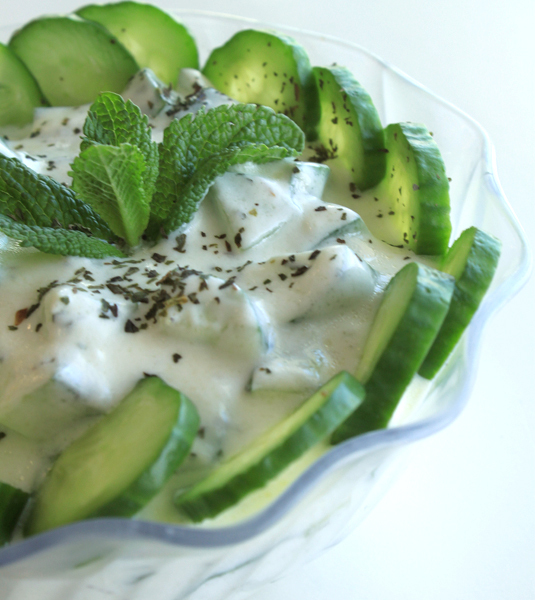 Put the yogurt in a salad bowl and stir in the garlic, salt, mint and cucumber. 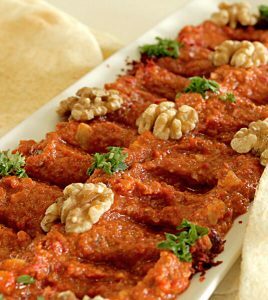 In a food processor, chop half of the onion and add 1 tablespoon of the Lebanese 7 spices. Add half of the meat and some salt. Mix. Add 2 ice cubes to obtain a creamy mixture. When the mixture has thickened and sticks to the bowl, repeat with the remaining meat. Wash the bourghol in cold water and wring it well. Add the bourghol to the meat. Mix the preparation by hand, add all spices. 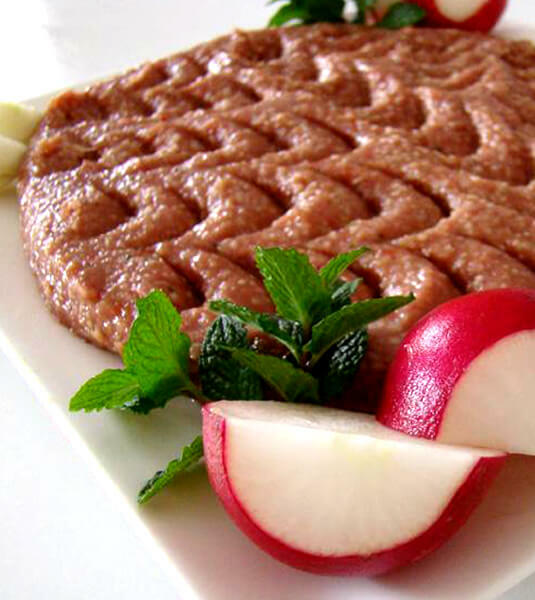 To serve the kibbeh nayeh: Drizzle with a little olive oil and serve with pita bread, white onions and fresh mint. Blacken or roast the peppers in the oven (turn them regularly). Let them cool. Remove the skin and the seeds. Toast the walnuts and cumin seeds in a skillet. Leave to cool. Mix peppers, nuts, cumin, salt, garlic, lemon juice, breadcrumbs and molasses in a food processor until the texture is smooth. While continuing to mix, slowly add the olive oil. Taste and adjust seasoning if necessary. Add fresh garlic, parsley, salt, pepper and Cyan Pepper.